as we've mentioned in the acetal gib strip how-to, there are pros and cons of using this material. however, we think that the pros outweigh the cons. you may be wondering if the use of acetal impacts the ability to mill materials such as aluminum and steel. no problems here. we have already made how-to's detailing the standard acetal nut that's simply tapped and installed with a quality ACME lead screw for the X and Y axes. now we go into the makings of an anti-backlash version of the nut. 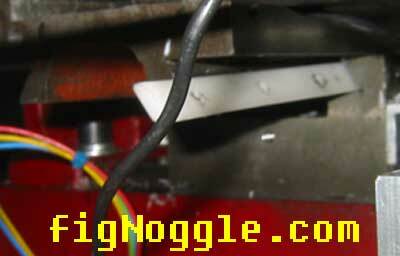 if you want to reduce backlash in your stock nuts, click here. here's the first round of prototypes. the x axis has less space to work with than the y so off-the-shelf nuts just won't work very well. here it is installed on the x-axis. 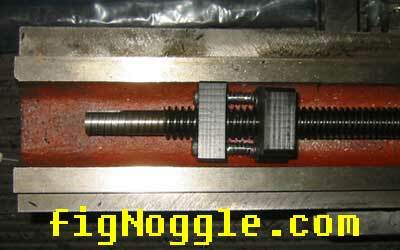 the principle here is that the springs offer preload to push apart the two nuts. 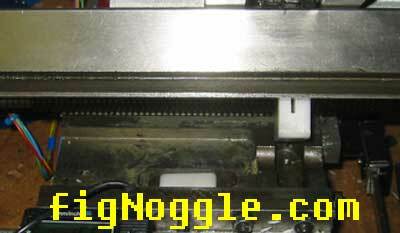 the major problem here is alignment and resulting torque creating not-so-nice binding thereby making unnecessary accuracy errors and friction. we also tested cam-type nuts but there's so little material left that reliability of the nut would be questionable. either way, the nuts had to be adjustable without major removal of the table assembly. 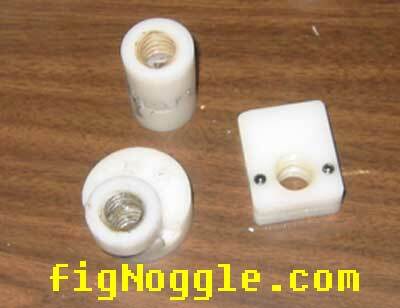 note that the y-axis nut is adjustable without removing the assembly. this is very convenient so that you can adjust backlash preload as you wish. here are some prototypes of the second round of designs. KISS. "keep it simple stupid." we knew this would work, but wanted to make sure we didn't leave out any iterations that may be better based on some of our design criteria. it's essentially the "split nut" design. the only foreseeable problem with this is that with a 8TPI thread across 0.630" and a 1/16" slit through the nut, you only get ~4-5 threads of contact. here it is in the y-axis installed. again, note that the "preload" is adjustable without removing the table assembly. 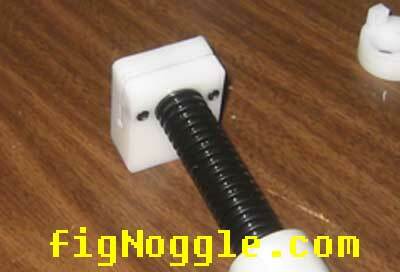 in the previous how-to of the ACME leadscrew and acetal nut, we described the "traditional" method of table removal. here's the other way. be careful not to nick the dovetails! with acetal gib strips, acetal anti-backlash nuts, and acme leadscrews adjusted, we're able to maintain repeatability of less than 0.001" and backlash + lead accuracy of less than 0.004". not too bad considering the materials cost is much less than even off-the-shelf ballscrews and nuts of like precision. 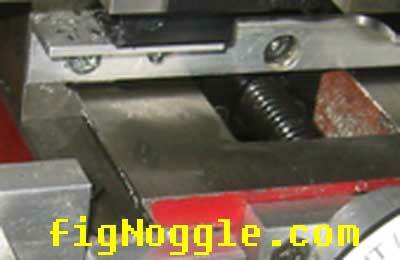 you may be wondering if this this still holds true when machining metals.. the answer is yes. as an example, we used a 2-flute end mill, 0.020" depth of cut (doc), 1000 rpm, 15 ipm, making a clamp base for use with mitee-bite clamps. considering the cost of precision ballscrews and nuts (this can easily be over $1,000 for the X and Y axes combined to guarantee no more than 0.0005" lead accuracy and "zero-backlash" - you still have the issue of cramming the nuts in the mini-mill cavity! 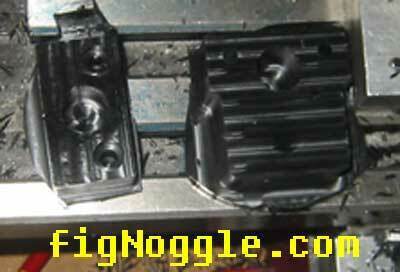 ), the acetal/acme combination is a very good performing upgrade that yields a pretty good "bang for the buck". plans and kits are now being finalized and should be available shortly. thanks for your patience! 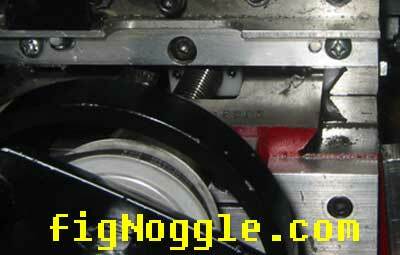 read about backlash and leadscrew error.